Since easter is just behind the corner we decided to share with you some interesting fact about Easter in Spain. Easter in Spain is annual celebration lasting entire week which is called Holy Week or Semana Santa in Spanish. It always starts from The Palm Sunday called Domingo de Ramos and ends with The Easter Sunday, el Domingo de Resurreccion or just la Pascua. Its roots can be found 500 years ago when the age of the Catholic Monarchs took place. Although it is celebrated all around Spain, Andalucia and it’s two cities Sevilla and Malaga are the leaders of the celebration. 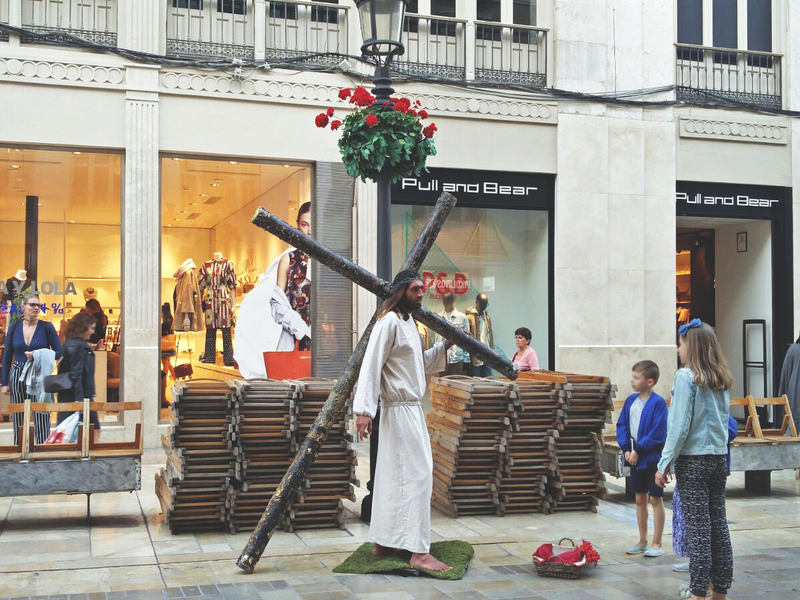 Semana Santa in Malaga and Sevilla could be easily considered as the biggest religious festival in Europe. If you expect to find an entire town in silence and prayers you are going to be in shock. Semana Santa is a joyful celebration filled with lots of noises and crazily a lot of people in the streets. Every year Malaga is prepared to welcome more than 5 million tourists during the Period of Holy Week who are coming from different parts of the world. Holy Week includes the massive processions around the city. Processions which are carried on around the old city and/or city center of the town always takes place in the evening and some days are taking place in the morning as well. The processions always contain processional thrones called Trones carrying the sculptures of the Jesus Christ and Mary. Some thrones can weight up to 5 tons and needs up to 250 men in order to be carried around the city. Every procession could cover the distance of more than 10 kilometres which is really long read when you think about the speed and the weight which presses the shoulders of the throne carriers. Besides the thrones, procession consists of penitents, special orchestras, and viewers. Penitents dressed in different usually dark color robes are walking together with the thrones and carrying the candles in this way spreading the light across the city. The orchestras play special religious music called processional marches which are prepared only for this occasion. Such unique one-week event attracts thousands of locals and tourists every day of the Samana Santa. Viewers also have a role during the procession time. Flowers are thrown to the favourite thrones while the processions pass by. Everyone, in general, can say that Spain is rich in its cuisine however not many tourists or foreigners know that Spain has special dishes and especially desserts dedicated only for Semana Santa. Torrijas are one of those typical pastries. It consists of sliced bread soaked in milk sugar and egg which is later on fried in olive oil. Once fried it can be dipped into honey, white wine, syrup, cinnamon or sugar. Another must have during the Semana Santa is so called La Mona de Pascua or just Spanish Easter cake. Traditionally the cake looks like a big doughnut which is topped with boiled eggs. However, now the cake has more modern form. Real boiled eggs are changed for chocolate eggs and some additional ingredients such as jam are added inside the cake. Just in Catalonia around 600, 000 cakes are sold every year. Pestiños, Buñuelos, Flores de Semana Santa, Hornazo the list could go on and on! You will definitely need to experience at least few Spanish Holy weeks in order to try all of those delicious cakes and pastries. If you happen to live somewhere where procession passes it could be a very good thing or very bad thing depends on what are you looking for. As mentioned before, Semana Santa is nothing about silence. Thus, don’t be surprised if you are asleep after a long day around 11 pm and hear drums getting closer and closer to your accommodation. This is pretty normal and you might be experiencing this all 7 days of the Holy Week. After the first experience of the Semana Santa, you will love it or you will hate it but for sure you will not be left neutral. Many Locals, especially in Sevilla and Malaga, are completely in love of Semana Santa and some would definitely pay to you for swapping the places with you. However, there are others who prefer to take holidays and go on vacation during that period. One more thing, do not expect to walk calmly through the city center of the city during this period. The old town will be completely paralysed during the Holy week. Almost none of the shops, restaurants cafeterias are opened which are located in the corresponding area. Some companies are giving the entire week off for their workers to enjoy the Semana Santa, however, most typical is to get Thursday And Friday before the Easter off. Thus, those days, don’t expect to do pretty much anything apart from Watching the processions. Ready for one week of Easter? You must be part of this amazing festival for at least one day. Share our experience, photos with us!